We arrived on a nice balmy day with only a light wind blowing at twelve thirty. The sea and the lovely coastal setting was superb as usual and put us in a good frame of mind. 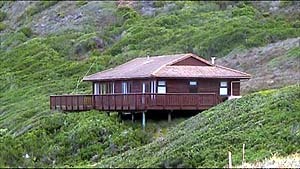 The cottages were ready and we had a chat to our landowner Fanie who gave me the shock news that the property was up for sale. Horrors! This is high priced prime coastal real estate and Fanie is sure to get an extremely high price for it, compared to what he paid for it years ago. The new owner may close the seaside cottages or refurbish them and let them out at an exorbitant price, far above what us poor DXer's can afford. Bad news indeed! We had always discussed this gloomy prospect amongst us, but Fanie had assured us he was not about to sell, but now he is over seventy and says he and his wife now want a quieter more relaxed life not tied down by the responsibilities involved in running a guest house and B&B. So we await further developments with trepidation. Anyway, we then started the battle of struggling up the sand dune from the parking area with our heavy radio gear and supplies. After half an hour it was done and we were hot, sweaty and exhausted, so a relax with a nice cold beer was in order. 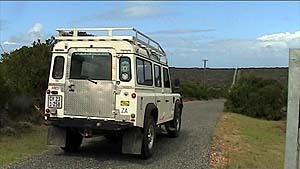 Vince, Gary and Derrick then arrived in Vince's Landy (Land Rover Defender 110). He was a bit downcast, having made only slow progress in the Landy, and after a late start he had hit heavy traffic whilst picking up Derrick, so he had arrived sometime after the time he had hoped for. The lads soon got busy laying out their antennas: three beverages for Vince, a BOG for Gary and another one for Derrick. Derrick also rigged up a small KAZ, so by about five the lads were ready and looking forward with great expectations to the night's DXing. I saw the lads working on the side of the hill on the warm afternoon sun, they had wide brim sun hats on except Vince who was shirtless and his bald pate shone in the bright sun. Struggling through the coastal scrub is really hard work and when Vince was finished he had scratch marks all over his legs. Vince and Derrick then gallantly volunteered to lay out my 300m BOG and with his skills Vince soon had that done. I'm grateful to them for that as with my bad back and painful hips I can no longer climb that hill anymore. I set up everything and by six p.m. was ready for the expected signals from Australia and the Far East. Everything was then set and I tested my gear and found everything working perfectly. I was annoyed to find I had left a vital part at home necessary for the operation of my Datong active antenna = damnation. I had hoped to use the Datong, which is superb on the higher bands, to try and get the fella's DXing from Clipperton Island in the Pacific. In the event I had no such luck with the other antenna's - pity. I had looked up the long range weather forecast before we left and a storm front was approaching that would hit us on Tuesday and Wednesday, clearing on Thursday in time for us to get the antennas back in clear weather. So it turned out, as it rained on Tuesday and Wednesday so we could not have our traditional braai (barbecue) and had to make do with the lovely fresh fish (hake) and chips from the Stilbaai shop. 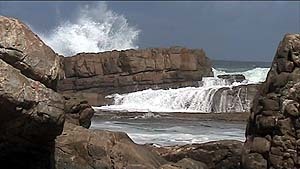 It's a pity, but the fishing village of Stilbaai has had it's fishing severely curtailed due to overfishing in the past, so now you can't get any of the other nice varieties of fish that were available from the harbour in the past. I guess overfishing is a worldwide phenomena. I am always mightily impressed by the menus Bjarne Mjelde writes up on his Arctic DXpeditions. The elaborate gourmet meals washed down with a fine collection of expensive quality wines impresses me no end and I often wonder how it aids the DX, as after a fine meal like that I tend to become soporific and want to doze off. 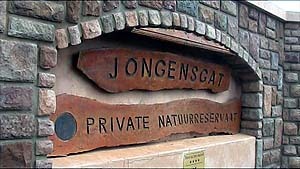 So I thought I better report on the meals at Jongensgat. Dawn, my wife, stoutly declares beforehand that she is going on holiday and she is not about to struggle in an unfamiliar kitchen with a rusty old gas stove that she does not know, preparing five course meals for me or the lads. So I get dried oats for breakfast, bread rolls and cold meat for lunch and an instant supermarket mushy prepared meal warmed up dinner. I daren't complain or she will refuse to come at all, and I really like her company and enjoy it when she comes with me to the DXpeditions. What do the lads eat? Not much it turns out, apart from the fish and chips. Vince likes to snack on peanut butter on bread and I caught Gary and Derrick filling up on instant two minute noodles heated in the microwave for dinner. As for the drinks, Gary doesn't drink much but Vince and Derrick like their whisky, so Vince brought along a nice bottle of Scotch single malt which he thoroughly enjoyed. As for me, I am a beer man but enjoy a nice wine with Dawn at mealtimes. This time we brought a selection of Sauvignon blancs for lunch and some red blends for dinner. I particularly enjoyed a fine sauvignon blanc from Nederburg in Paarl, not far from Cape Town, and in the foothills of the Du Toits Kloof Mountains. Most of the cheap Sauv blancs I drink are just tasteless vinegar, but the Nederburg version really has the fine gooseberry and herb flavours that they brag about in this cultivar. We made short work of a bottle of that. As for the radios, Vince brought along his Drake R8A which he swears by, with his old Icom R70 as a standby. Gary brought his famous much talked about Frog (Yaesu FRG7) and his newly acquired Icom R71 on which Vince had done some mods to improve the audio and enable the preamp on MW. Gary set the two up side by side, but we all had a laugh the next day when we found he had disconnected the Frog and pushed it to the back. Gary paid only E70/$100 for the R71 and is well satisfied with the upgrade from an analogue RX to a digital one with better filters. Derrick had a Yaesu FRG7000 on top of which he mounted his Icom transceiver, an early version in the R70 class. I had my Icom IC-756PROIII which caused me a lot of pain three and a half years ago when I had to find the massive amount of money for that, but now the sheer pleasure of operating such a fine radio, the initial pain of the purchase has long been forgotten. I get tired of a radio after a few years though and hanker for an upgrade to the latest, so have my heart set on an Icom IC-7700. I have tried to interest Vince in upgrading to a DSP radio and had suggested the Elecraft K3, but Vince has other priorities in life and is quite happy with what he has, as are Gary and Derrick. But chatting about these things we all agreed that a Perseus SDR able to record 800 Khz of spectrum simultaneously would be a huge advantage over the dawn enhancement when the band really opens up for half an hour and it is impossible to catch everything at critical top of hour ID periods. Maybe one of these days one of us will break the mould and lash out and get one? "Official" sunset is at 1657z but some signals start coming in at 1616 and after. Mainly only the high powered Taiwanese, Chinese and Korea. Not a sign of Australia, particularly the high powered 720 ABC Perth, very strange. A disappointing evening! However, despite the noise from the coming storm Gary and Vince did log Japan. 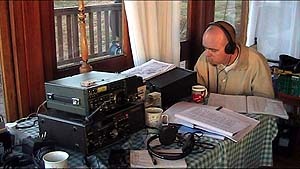 In the early hours nothing from N. America is coming in, just lots of Brazilians, so I try my hand at HF and get a clutch of aeradio and AFN stations. Later I get bored with that and try some LW, but no AM stations are coming in, so I try my luck with the NDB beacons, but the best I can get there is 312 Khz GBE Gaborone, Botswana, 720 miles/1150 km's away. Not very edifying. Finally about 0300z some MW action - WWRU New Jersey comes in then some Europeans, 1458 Sunrise R. London and 1377 France Info, Lille plus 1494 Clermont Ferand. Not a very satisfying session. Finally the Australians arrive tonight with ABC Geraldton quickly followed by Perth around 1615z. The best catch of the evening turns out to be the low powered 873 Khz 6DB ABC Derby. Meanwhile the forecast storm that has been raging around all day is giving a whopping "S9" of static, making it almost impossible to get any low powered MW DX. So I turn in for bed early somewhat disgusted. The storm static is still raging, so I turn to the Tropical Band and after a while get a low powered 1 Kw Peruvian. Later at 0400z I get a lone U.S. station from Boston, but nothing else comes in until after sunrise when I get a nice ID on XEPE, Tijuana "1700 San Diego AM". 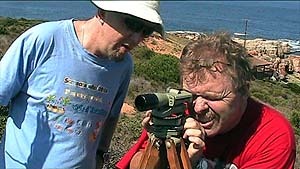 Gary and Vince get a couple of stations from the UK and Europe. Not nearly as good as our previous visits to Jongensgat! Sunset brings only the high powered Chinese and Taiwanese, with the addition this time of R. Thailand on 1467 khz, a 100 kw station. Still no low powered Australians again, something which Jongensgat are famous for, but now disappointingly absent. 0200z brought some action with Big L from Holland followed by a BBC relay on rare R. St. Helena. Nothing much further until first light when a couple of East coast U.S. stations came in. Gary and Vince get a feast of Argentinians plus Paraguay and Venezuela that finally broke through the ever present Brazilians. Altogether not the best coastal DXpedition I have ever been on, actually, wrapping it all up it was very disappointing, but guess you can't expect to hit the jackpot every time you go away - a combination of poor propagation and heavy static from the storm. Then the last signal has faded at 7.00 a.m. its time to have a quick breakfast and get the antennas down and everything packed up and put into the vehicles. Fortunately the rain had stopped and the sun come up, making it hot work sweating on the hill and fighting through the thick bushes. Vince, who had strung out my BOG, said I simply needed to reel it in from the cottage, saving me a climb up the hill, which I couldn't do anyway. I didn't want to trouble Vince and Derrick with my problems, so started reeling in my BOG, but it soon broke about 30m up the hill. so Dawn and I set off and tried to reel it in from higher up. We got about 100m up the hill and came to a really thick impenetrable wall of thicket; tried reeling it in some more with more tugging on the wire, but again it broke somewhere in the distance. At that point we decided to abandon the wire as it was now too stretched out anyway and would not be reliable for future use. That class of wire is not too expensive to replace either. So we struggled back down the hill quite exhausted from that effort and my hips and back giving me hell. Then the task of getting all the heavy gear down the sandune to the car got underway. Somehow lugging the stuff down the dune at the end seems far harder and more taxing than when you start out and are all fresh and enthusiastic in the beginning. There are about six heavy boxes weighing in the region of 20 kgs. each, plus sundry other small items, requiring many trips up and down the dune. We finally finished at nine thirty, hot and sweaty and exhausted and every bone in my body screaming out in agony. I really can't do this anymore I thought. Even if Fanie doesn't sell Jongensgat soon I doubt if I can do that again. I will just go to Seefontein which is on flat ground and the vehicle can be parked right next to the entrance door and the BOG can be easily laid out on the flat ground along the road. We'll see? So we drove leisurely home and stopped at a roadside tourist trap to look at the shops and have some coffee whilst we mulled over a pleasant and fruitful DXpedition. So that you think is the end of the story - we all went home and lived happily ever after. No siree! Not so lucky, things didn't end there. About half an hour from home I was mulling over the pleasant thought of a nice cold lager when it dawned on me that I had switched off all the power to the house, including the fridge...!!! Horrors! I then told Dawn I had switched the fridge off on our departure - there was a stunned silence, then mount St. Helens erupted and I got it chapter and verse. We arrived at the shop at home in Montagu as Dawn had now to shop for everything as her nicely prepared meals were all now rotten, as were all the other fridge full of perishables. I was filled with chagrin and remorse at my stupidity and went and bought her a nice box of chocolates and included a good sum of geld to cover the damage. This mollified her slightly, but I knew the pain would not be over until the stinking rotten fridge had been cleared and cleaned and restocked. Oh hell! Vince didn't fare much better either, as after getting all the beverages in (and finding and recovering my abandoned 200m of wire) he set sail for home, but about 120 kms. from home while driving through the provincial town of Worcester, the clutch on the Landy packed up and the vehicle was well and truly stuck. Vince, being the hardened soldier he is, contemplated thoughts of expensive tow in's and dealer repairs; decided to press on home with the Landy masterfully changing gears by synchronising the engine speed. Fortunately he managed it, probably due to the high torque diesel engine that made it possible and his entrepid driving skills. So that really is the end of the story, disappointingly not on the usual high note.